This season debuts September 14th on FX with a two-hour special starting at 9PM ET/PT. The premiere features the 16 elimination bouts to get into the TUF house. The upcoming season will run for 13 consecutive weeks, airing Friday nights at 10PM ET/PT following the premiere. The tournament winner will be crowned at the live finale on December 15th on FX. 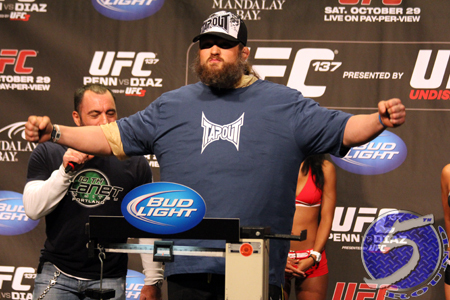 Heavyweights Roy Nelson (Pictured) and Shane Carwin will serve as this season’s opposing coaches. The bitter rivals will headline the finale.